Once you have logged in, you will find yourself on Memorials Brightspace homepage. From here there are two ways to access your course sites. NOTE: Course access will typically begin on the first day of classes and end on the last day of examinations for any given semester. The “Course Search” button on the Minibar located on the top of your page, since the Minibar is available on all pages of Brightspace this can be used to quickly navigate from one course to the other, without having to return to the homepage. Selecting the search button will list your pinned courses, recently accessed courses and a search box that will allow you to search a course name (NOTE: The search bar will not appear if you do not have access to more than 20 active courses). 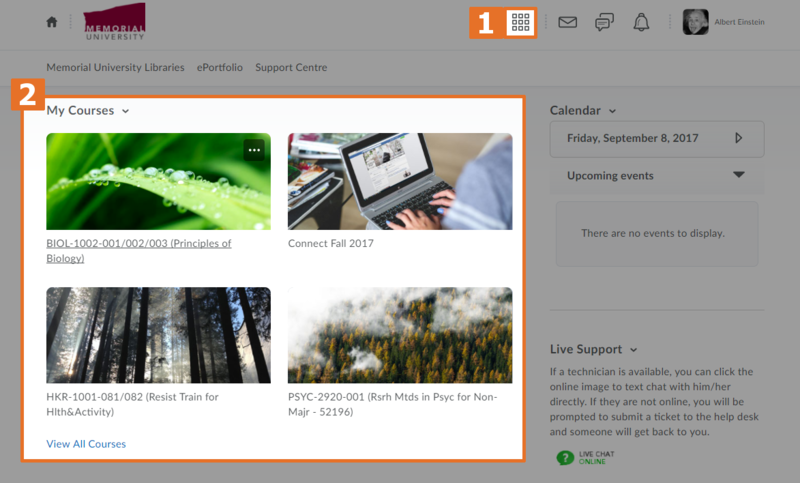 The “My Courses widget” will allow quick access to courses, only pinned courses will appear on the homepage. To view unpinned courses click “View All Courses” located on the bottom of the widget. When you pin a course it will not only display on your Brightspace homepage it will also appear on the top of the course search list. It is recommended that you pin your most used courses, in most cases that will be the current semesters courses. To pin your course, click the “Course Search” button located on the top of the homepage, find the course you want to pin and click the pin icon on the right. 1: This is an example of a pinned course, it appears before all unpinned courses in this list and will appear on the Brightspace homepage for easy access. Selecting the pin icon again will unpin the course. 2:Here we see an unpinned course, selecting the pin icon will pin the course. If you are having trouble finding your online or on campus course site in Brightspace, first try “View All Courses” in the My Courses widget and then the Course Search button. If you still do not see your course, log into Memorial Self Service and ensure you are registered. NOTE: When registering for a course after the start of a semester Brigthspace access can take up to 6 hours. On campus courses: Not all instructors choose to use Brightspace for their on campus courses, if you have confirmed your registration but cannot see your course, contact your instructor to discuss if they plan on using Brightspace. Online courses: Online courses are only available after the start of classes, if you register after the start of classes it can take up to 6 hours to appear. If you still cannot see your online course in Brightspace, please contact our Support Centre.